Every year, PennDOT recognizes some of its most innovative employees who approach their work each day as a mission to serve the people of Pennsylvania with care and dedication. Recently, 29 employees from around the state were given a Star of Excellence Award, the agency's highest recognition. "The Star of Excellence award recognizes PennDOT's top performers, the very best of the more than 11,000 people who work long and hard day in and day out to improve their individual performance and address the many transportation challenges," said PennDOT Secretary Leslie S. Richards. "All of us take our responsibilities very seriously, and our award winners serve as outstanding role models." 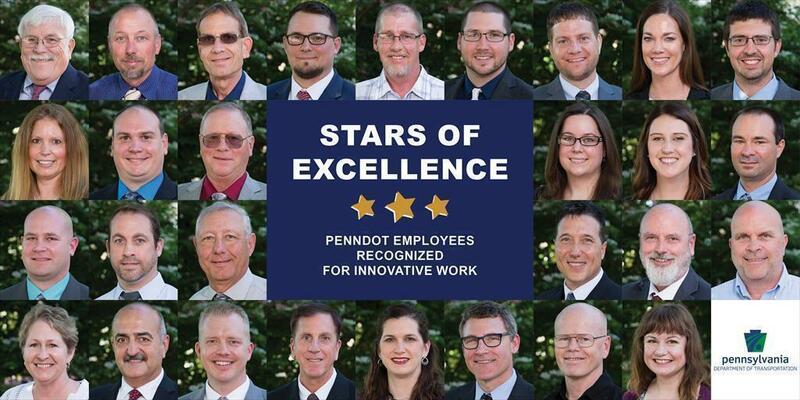 From the descriptions of our Stars' achievements, you will see how the day-to-day work of exceptional individuals spells great success for PennDOT: significant savings for taxpayers, improved service delivery, and advancements in safety and productivity. Note: If you are having trouble viewing the slideshow below, you can view the album on Flickr​.